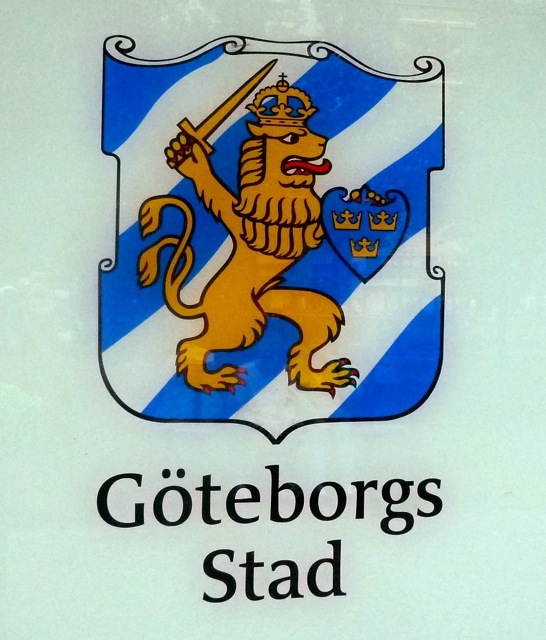 After a pretty bad ordeal with my train from Stockholm, I still didn't feel that great as I arrived in Gothenburg. I got a call from my host, Hampus, as I arrived, and he was there at the train station, with another couchsurfer he's hosting, Bernhard from Germany. It was both their first time couchsurfing, but they are really cool guys. Hampus has just started working at a bar and is enjoying it (and its perks) very much, and he will start studying geology in the fall. Bernhard is a music student in Dresden and a bass player in a couple bands. Anyway, we met up, had some food at Burger King, got our transit tickets, and I bought my Swedish flag. 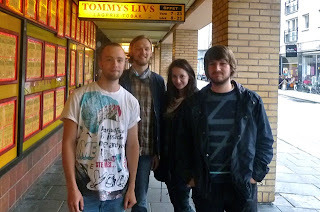 We then went to Hampus's apartment, in the "ghetto" of Gothenburg. It's nice and spacious, and the many immigrants make the neighborhood feel somewhat like England to me. We hung out for a bit, having a coffee, and then Hampus enthusiastically showed us around the city! We took the tram in to the city center, and walked around to the university and his high school. We passed the science center, where we glimpsed a couple anacondas, and in the distance was a brand-new theme park ride that dropped riders several hundred feet straight down from a tower. Along the way, we learned how to count to 10 in Swedish. Next, we embarked on a quest to get kannelbullar (Swedish cinnamon buns) and smörgåstårta (a big sandwich-cake with many layers of meat, fish, etc.). 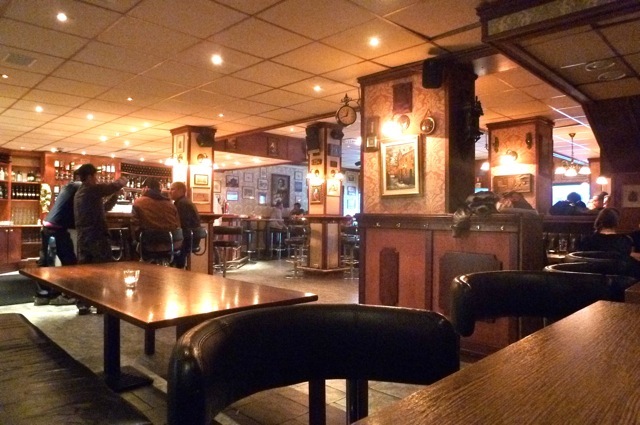 But we weren't really successful, so we headed to Hampus's bar, the King's head. There we met his brother Max and his girlfriend Maja. The night went on, and Hampus kept getting up to talk to the regular customers and his coworkers. The people there were very chill. 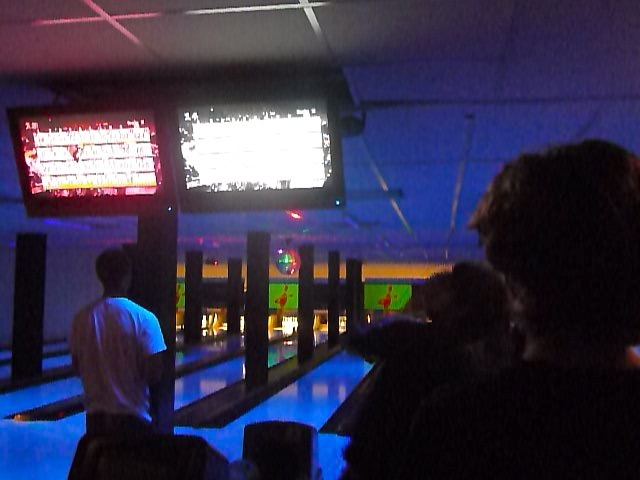 After a little bit, some regulars and coworkers decided to go bowling, so we joined them, just up the street at a semi-underground bowling alley. There was Valter, coworker and organizer of the evening, Kim, the Korean-Swedish music/band manager, Erik and Essy (Simon), and Arvid, who made everyone feel better by having the lowest score. Bernhard and I shared one name "Americano." Hampus and Bernhard constantly reminded me that they never bowl, but they bowled just as well (just as badly) as I did. We ended up returning to the Kings Head and having several more rounds of beers. We were introduced to several more of the regular customers and Hampus's coworkers. On the tram ride back to Hampus's, there was a loud drunken alcoholic from Peru that kept singing. It was hilarious. We made some sandwiches before going to bed. The second day in Gothenburg began, unsurprisingly, late - we woke up around 11:30. A light breakfast of sandwiches and hard Swedish bread fueled us up for the day. The three of us headed to a big park (Slottsgården or something) in the center of town, where there are plenty of animals that you could see and pet. Hampus wasn't sure if he would be called in to work. We saw plenty of animals there, seals, pigs, rabbits, horses, penguins, and, most impressively, deer and elk. 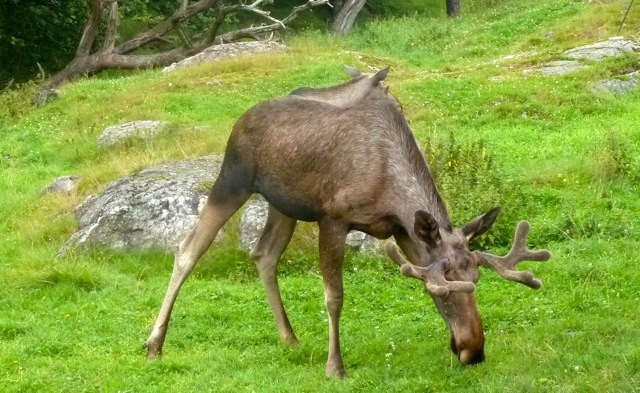 It's amazing that there's just a public park with all of these animals so easily accessible! Unfortunately the weather was not cooperating: There were rain showers all day. We then checked out the frisbee golf course, a sport that Bernhard and I were completely unfamiliar with. I didn't feel like paying 50,- kr to play so we just threw around Hampus's frisbee before some guys started staring us down, prompting Hampus to lead us away. We were all tired, so as we sat on a park bench we decided to continue our quest for smörgåstårta, but none of the nearby cafés had any. Instead we stopped by a grocery store, where Hampus bought toothpaste and Bernhard got some kannelbuller. It was 4:20 and we were considering going home with some take-away food when Hampus suggested we go to a cheap Chinese buffet in the center of town. Cheap, greasy, salty food? Hell yes! So we headed there and I gorged on three plates of heavily fried noodles and chicken. The German and Swede were somewhat impressed. We finished and rushed out to catch the tram as it was just arriving. As we got off the tram, Hampus realized that he was sitting on his toothpaste, which had exploded all over the inside of his back pocket. Gnarly. And then he realized he forgot his bag at the restaurant. So we trimmed back to the Chinese restaurant, where the bag was (the host was asking if we wanted to eat more). We exited, and deja vu! Our tram was just arriving, so we ran again. Then, finally, we got back to the King's Head, where we had a couple more beers. Kim was there, we talked about New York and he gave me some advice on places to visit in Kreuzberg, Berlin. We left around 8 and returned to the apartment, where we watched The Hangover before going to bed early, since I had to be up early for my ride to Berlin. My alarm woke me up at 6:54am, and I quickly had some breakfast and got my things together to be picked up. I watched some TV - Dr. Oz was on (yawn) - before waking up Hampus and Bernhard. We said bye and they went back to sleep, and after a few minutes I got a call from Christoph saying that he was outside. He pulled around in his big Mercedes van/truck. We spoke German for much of the way, giving me an opportunity to practice my well-neglected language skills. We stopped at Max because I wanted a burger and rushed through a supermarket in Trelleborg before boarding our ferry to Sassnitz at 12:30. The ferry was pretty uneventful, and had fewer amenities than the ferry/cruise ships I had taken before.